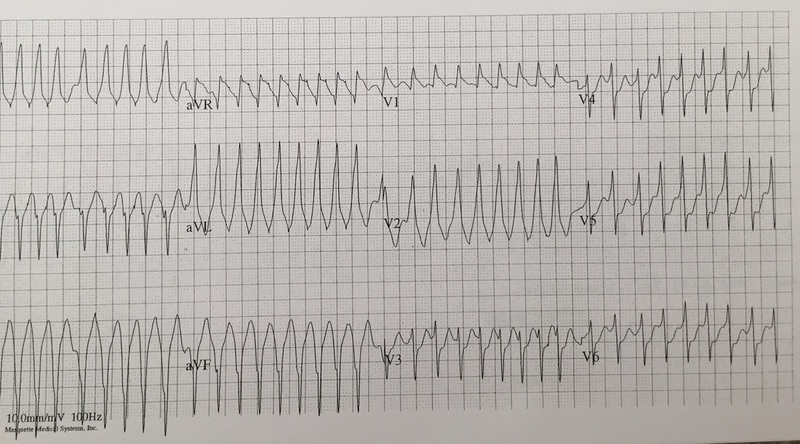 90 y/o woman h/o sick sinus syndrome, AF, and a pacemaker presents with atypical CP. Troponins are negative, CTPA is negative for PE. She denies palpitations, shock-like sensations, or chest wall contractions. Palpated HR corresponds with QRS complexes on the monitor. What's going on with this pacemaker? Is the malfunction the cause of her symptoms? HPI: 50 y/o male with hx of COPD, heroin use, and recently diagnosed cor pulmonale presents with 3 weeks of lower extremity edema. No chest pain, shortness of breath, or palpitations. 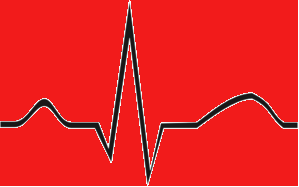 An EKG is obtained in the emergency department. What does this EKG tell you about the etiology of this patient’s lower extremity edema? Is this EKG in sinus rhythm? 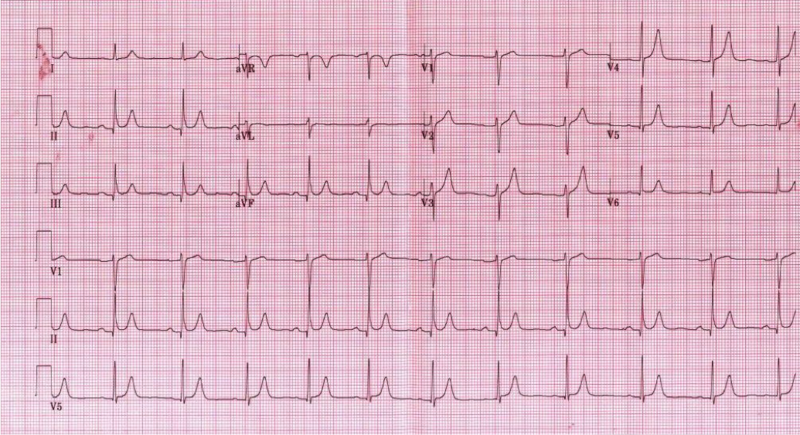 Question: Is this patient experiencing a STEMI despite the lack of ST elevations ≥1mm? How would you diagnose this and explain to your cardiology consultants? -What kind of block is this patient in? -If the EKG is unchanged from previous, does this patient still require admission for syncope workup? QUESTION: Are these benign T-wave changes? What study needs to be obtained to confirm the diagnosis? Question: What interval is abnormal in this EKG and what is the most likely lab abnormality that can be expected as the cause? 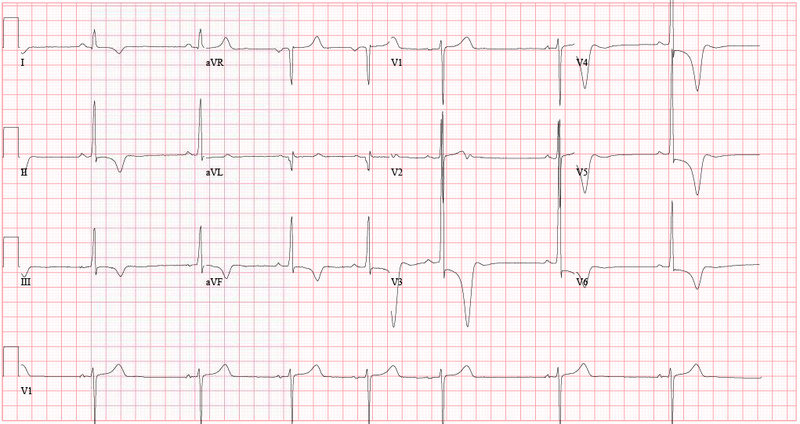 Question: What is the rhythm and what is the indicated treatment? Question: What diagnosis does this patient have and what is the immediate treatment? Could It Be Slow V-Tach??? 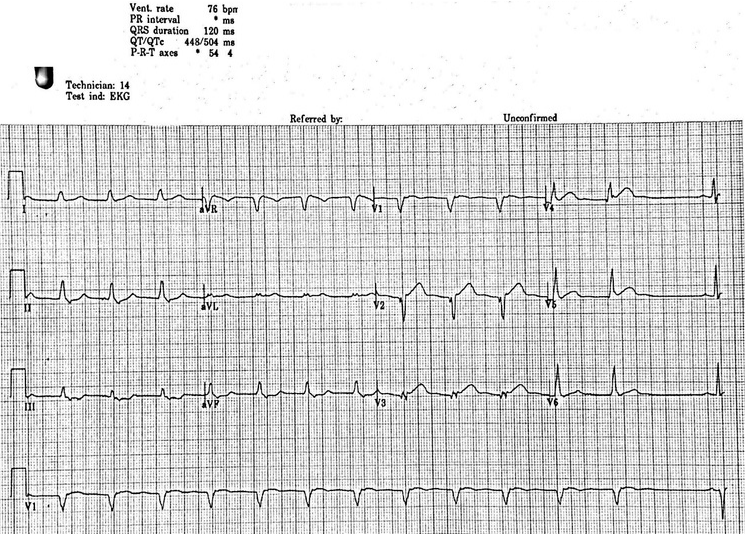 EKG #2: After a successful life saving intervention was performed, the following EKG was obtained. 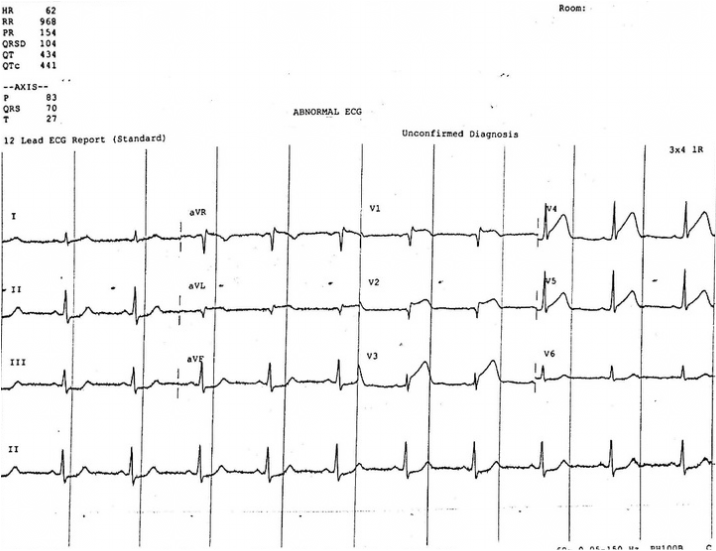 Question: What rhythm is the second EKG and what is the indicated treatment?